For this weekend project, I wish to give you a brief light-hearted approach which should cover the basics. 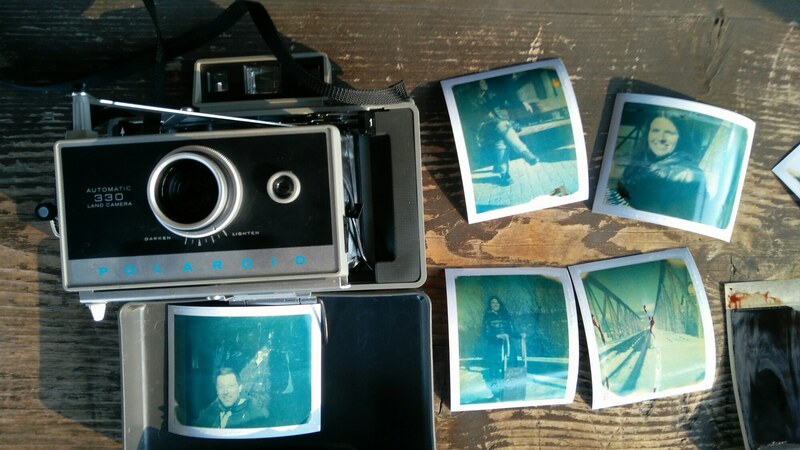 So after reading this article you will be able to produce your own photographic prints. Anyone can do this. It’s not rocket sciences! I’ve even included a checklist which you can print out below. The biggest investment will be an enlarger.T here are plenty of enlargers out there.I have a post blog on how to choose the right one for you. My enlarger was given as a Christmas present in 2017! (Yes I’m a year late!) It’s solid 1958 Durst 606 Enlarger. It may be an antique however it’s silver stature and it solid wood base board ensures an elegant presence in anyone’s darkroom. Next up, find a dark place, a really dark place where you can’t see your hand in front of your face. Is it peaceful a little bit scary ? The darkroom, I made is a makeshift one, knocked together in the cellar on a Saturday morning. Two old tables which weren’t in use, one prop up by two long black plastic builder’s buckets. The later serves as the wet table with the developer, a stop bath and finally the fixer. I have to say I am contend with the outcome and layout of the new setup. If I could wish for anything, it’s another table for searching and handling my negatives. I’m sure a spare table is waiting for me somewhere. There is no timer for the enlarger, no general timer or grain focuser this is the bare minimum! You don’t need so much anyway. Of course in the long run they are recommended items. It has definitely become clear a good darkroom requires space for three areas in particular. 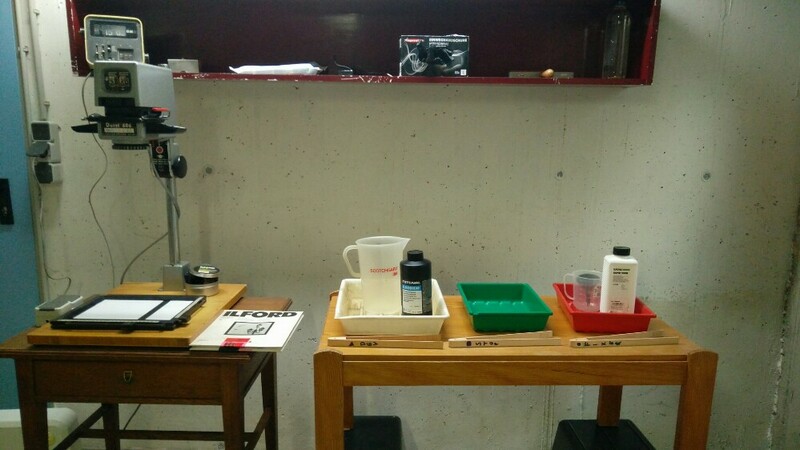 That being the enlarger, the wet area – chemicals and trays and of course the dry area for negatives and photo paper. Once you have a light tight room where no one will disturb you, you can begin to create awesomeness! My goal here was to get up running within the weekend. Most things can be bought secondhand such as the trays, funnels, jugs, beakers and indeed the enlarger too. Admittedly, I didn’t have a safe light at all. I had from previous work with Wet Plate a headlamp which features red LED light. This was to be my safe light which turn out quite practical in terms of moving around from the negatives area to the workflow of development. Tongs not thongs! The wooden tongs I bought in Flying Tiger on the way home from work on Friday. I wrote on each of them their use with a permanent marker – ‘Dev’, ‘Stop’ and ‘Fixer’. Note: don’t mix up your tongs and keep contaminated to a minimum when transferring the paper to various trays. When handling or clearing up chemicals its important to protect your hands and eyes with suitable equipment. Such eye protection and rubber gloves. I would recommend purchasing them and not taking any chances on old expired developer or fixers. The Fixer is the same as you would use for developing film (Ilford Rapid Fix). In my case I had just had to purchase the developer. 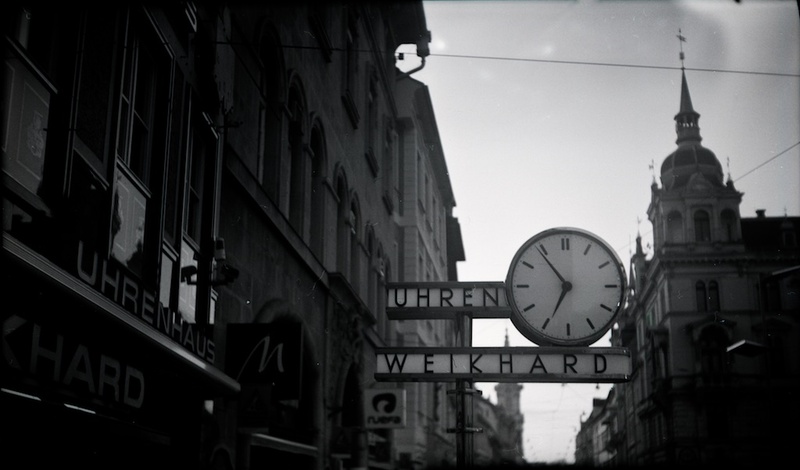 I wasn’t choosy with the developer I just ask my local photography shop here in Graz, Austria. Explained I wish to develop some prints on the weekend. He handed me a black container from Tetenal. The instructions were stated clearly on side with the option of 1:4 or 1:9 parts water. I choose 1:9 for economic reasons and longer time. This is just water, yes I can do better. It not so important for starting off. In a discount shop I found one of those lightbox where you can arrange letters to say whatever! This turn out to be perfect for viewing both 35mm and medium format negs. Find a negative that’s clear and without dirt or scratches. Place into your enlarger and focus it the best you can. Important to set the enlarger’s lens aperture to ƒ/8 for starting off. The paper packs I had was from Ilford. A pack which came with the secondhand Durst 606. It was old and dusty. There was a newer pack of multigrade paper which I had purchased the year before. I started with the older paper. It seems to be grade 3. The Durst enlarger does have a filter tray above the negatives carrier which is used in conjunction with these papers to achieve a certain contrast. However I focused (pun intended) in getting a print and working out development and expose times for the entire workflow. Bottom line, don’t worry about them. The developer I was used which was mixed 9 parts water and 1 part chemical requires 90 seconds to fully develop at 20 degree celsius. However my temperature was somewhere between 10 – 13 degree. I reckon this may effect the time. Nonetheless I always aimed for this time either way. Sometimes it was too longer indicating that my expose time under the enlarger was too long. The exposure to light and development time are the most important things regarding time in the entire workflow. The fixer and wash time aren’t too much of a problem if you overshoot them by a minute or two. However the enlarger time in my case was anywhere from 5 to 25 seconds depending very much on my negative. I have various negatives 35mm and medium format 6×6 and 6×9 from a range of film cameras. If you need more time increase your enlarger’s lens aperture to f/16. I was using f/8 all the time. Now how to workout the right exposure time ? I figured the old paper should be up for the job. I knew to achieve the best exposure time you should use a strip of photographic paper and expose for various intervals of time. Once your negative is projected to the right size and focused switch off the enlarger’s lamp. Rob a scissors from the kitchen. 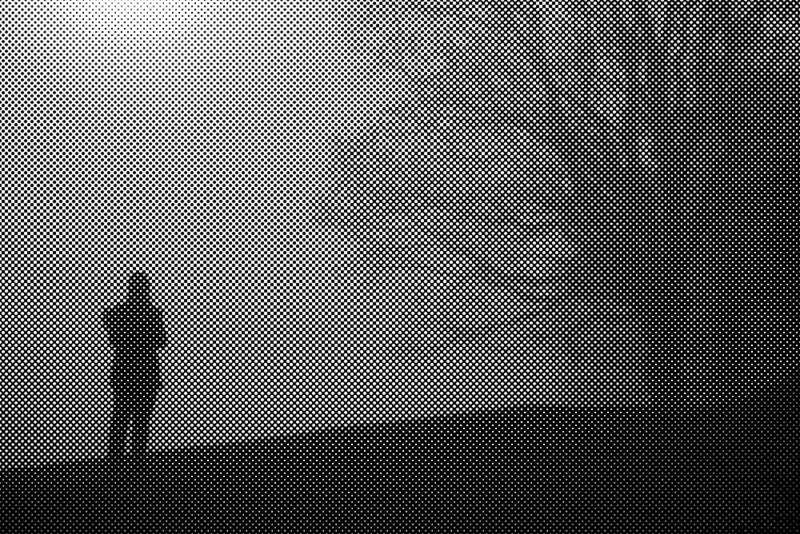 Cut a strip from the ancient Ilford paper about 2cm in width and the entire length of the paper. Place over the projected negative. Put in such a way to ensure a decent range of grey tones would be exposed across the strip. I covered up 1/8 of the strip to begin with it. Turn on the enlarger’s light, exposed for 5 seconds then move the mask 2cm exposed for another 5 seconds and continued until a minute was reached. Then switch offthe enlarger. I don’t currently have a enlarger timer switch yet or as you may realise a darkroom timer either. Both items are useful but can be substituted quite easily if you are starting off. Hence the use of the kitchen clock! Still working under the safe light. Develop for 90 seconds and agitate the paper by move it with the developer tongs. Drop the paper into the stop bath and use the stop tongs to agitate for 60 seconds. Finally place the paper in the fixer for 60 seconds again but gently agitate for another 60 seconds. Hang the prints up to dry. From the strip test choose a good a exposure time and repeat the process for the desire size of photographic paper. Regarding 6×9 format the Durst 606 enlarger can only handle up to 6×6 in size. But this just means the image has to be cropped into the size your enlarger can handle. Medium format is really great for cropping and very flexible for enlarging more so than 35mm format. I can happily say its worth shooting medium format film in terms of sheer quality and resolution. Print from the 6×9 negative from the Agfa Clack! The checklist I’ve put together is a basic list to get you up and running over a weekend. Hang your work out to dry on a clothing peg and relax it’s time to have a beer and enjoy the labours of your creation!